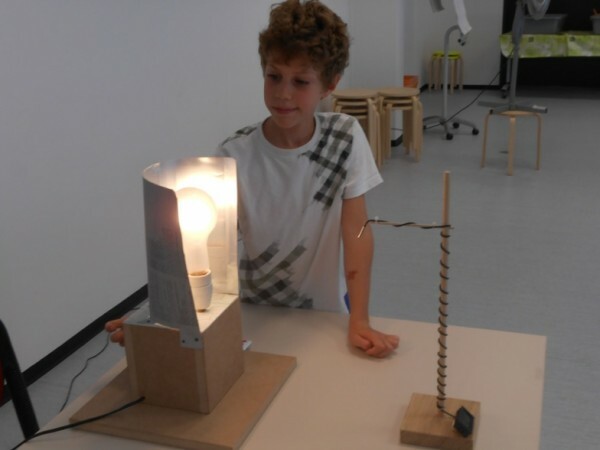 Although its “Exoplanètes” exhibition is aimed to a wide audience, the Natural History Museum of Geneva is also targeting children by offering them exhibition-related activities. As a partner of “exoplanets” the NCCR PlanetS is therefore organizing activities for children entitled “could we live elsewhere” every Wednesday afternoon in August and September. As a first approach, the aim is to show children that a habitable zone exists around the stars. For this purpose, the museum built an apparatus made of a large dimmable lamp representing a star and a planet placed on a rail, enabling it to move away or closer to the “light star”. A thermometer placed on the planet measures the temperature, showing the influence of the distance and brightness of the star on the location of the habitable zone. This experiment demonstrates the children that the distance between a habitable planet and its star is not necessarily that of the Earth to the Sun.